…is a novel about a world created by those whose interest is in their own wealth and power at the expense of all else. The psychopaths are members of all political parties; they are secular and religious. They have infiltrated all human organizations and institutions and caused them to become corrupt. Psychopaths have no moral or ethical constraints. And in their pursuit of personal gain, they are looting the entire world. This is the tyranny of psychopaths. Against this backdrop, we follow the stories of people from very different backgrounds who go through formidable transformations. Sam is a computer engineer who was laid off but is determined to save as much as he can of his middle-class life for himself and his family. Ruth is a public school teacher whose school is closed but she continues to believe in and work for an evolutionary leap in human development. Hugo is a young man who abandons his college education because of the overwhelming debt and joins the anarchists. Everett is the son of a mega bank owner who decides he must destroy the economic system. Cedric is a man who joins the Army and goes to war in the Middle East; and when he returns, he takes up the cause of local activists. And finally, Howard is the brother of a televangelist who goes on a quest for answers to tough questions. Each one finds his or her way to a place called Occutopia where the Occupy movement has taken up residence in an empty high school in Portland, Oregon. And there, those who have fallen out of the economic system come together to organize and create a better world. They take the beginning steps toward addressing the root cause of the overwhelming problems we face – the tyranny of psychopaths. Reviewers are saying ‘Awesome and overwhelming!’, ‘Page-turner’, ‘Couldn’t put it down’. 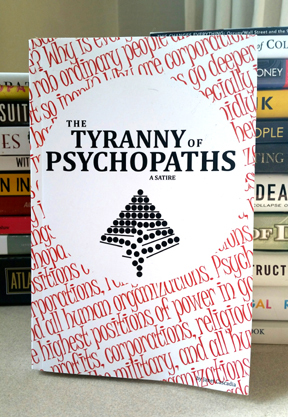 Tyranny of Psychopaths is extremely relevant to where we are as a society. The author has really done extensive homework to not only point out our ills but then offer well thought out remedies for social change. Several different scenarios of psychopathy are presented. These scenarios will be hauntingly familiar to most of us who’ve been paying attention. Enjoyable to read and one of the most thought provoking books I’ve read in years.